On Friday 9th November 2012, as part of an ongoing campaign by IHRC against Israeli apartheid, 40 human rights activists protested outside the G4S London Headquarters against G4S complicity in Israel’s administrative detention and torture of Palestinian children. 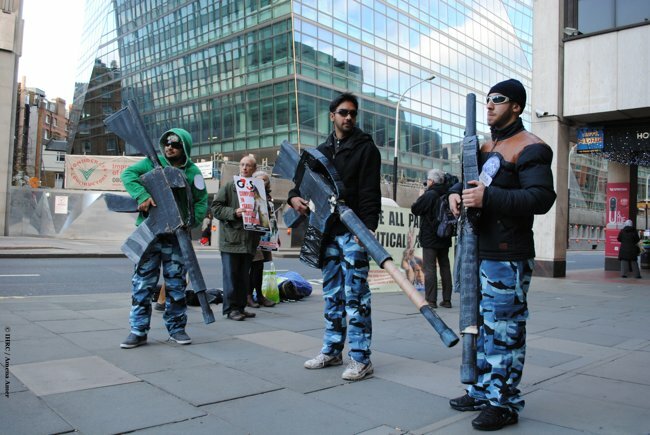 Five activists dressed up as IDF soldiers with paper mache guns as part of a checkpoint stunt outside the G4S HQ to show the public the inhumane treatment that the Palestinians have to endure on a day to day basis in order to get to a hospital. This drew a lot of public attention and some members of the public agreed to participate in the stunt acting as Palestinians trying to reach a hospital but being denied entry due to not having Israeli ID. IHRC also urged all its supporters to write to their local MPs urging them to pressure their Israeli counterparts into releasing all political prisoners, and provided a sample letter on their action alert page for guidance.